FONTAGRO is in the process of designing a network to modernize water resource management in agriculture in the countries of Latin America and the Caribbean. (Washington, August 3, 2018). FONTAGRO is extending an invitation to agencies interested in taking part in a workshop to develop a “Platform for Water Management in Agriculture, 2030-2050.“ The platform will be comprised of a multi-agency network and its objective will be to identify relevant actors, successful irrigation research and management projects, technology transfer experiences, and agricultural modernization challenges associated with family farming in the countries of Latin America and the Caribbean, and in Spain. 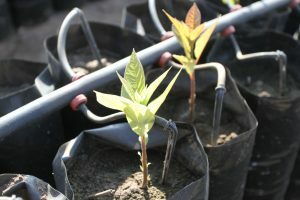 In order to make this irrigation modernization process broader and more extensive, FONTAGRO is presenting the initiative through a funding mechanism known as a “seed fund.” The fund will be used for the first phase of development of a network of multiple international agencies, spearheaded by agricultural research institutions from Chile, Argentina, and Spain, in partnership with public and private sector agencies. For development of this seed fund, a workshop will be held to devise a broader project (consensus project). To formalize interest in participating in this project, a counterpart contribution letter (link) indicating a cash or value contribution must be submitted. FONTAGRO is a sustainable co-financing mechanism that promotes research, development, and innovation in agriculture in Latin America and the Caribbean. It was established in 1998 and is comprised of 15 member states that have contributed approximately US$100 million in capital. FONTAGRO is sponsored by the Inter-American Development Bank (IDB) and the Inter-American Institute for Cooperation on Agriculture (IICA). Its Technical and Administrative Secretariat is based at IDB headquarters in Washington, D.C. FONTAGRO has co-financed more than 135 projects and initiatives for its member countries in the amount of nearly US$105.5 million, including contributions from other funders and executing agencies. The countries that make up FONTAGRO are Argentina, Bolivia, Chile, Colombia, Costa Rica, Dominican Republic, Ecuador, Honduras, Nicaragua, Panama, Paraguay, Peru, Spain, Uruguay, and Venezuela. to participate in a multi-agency network for the establishment of a "Platform for Water Management in Agriculture 2030-2050"
The need to produce more food in a changing environment, with increasing population, increased competition for the use of water resources between economic sectors, and the effects of climate change (aridization and incorporating rainfed areas to irrigation), represent a future with higher restrictions on the availability of water in agriculture in the world and in the countries of Latin America and the Caribbean (LAC). Despite this complex outlook, the increase of knowledge in the efficient management of irrigation, generated by the research institutions, as well as the evident technological developments of the last decades, allow us to better approach the changing panorama that agriculture will face. The quick emergence of technological innovations for the efficient use and management of irrigation water clearly represents a way to improve agricultural supervision, increase the water productivity, adaptation to climate change, among others. In this way, the conditions for a quantitative management of irrigation management can be generated, contributing to the sustainability of agricultural activities. The comprehensive view offered by precision agriculture, for example, is an adequate conceptual framework for designing strategies for the rational use of water resources in agriculture, providing useful information to decision makers at different scales of aggregation, such as watersheds, user organizations of rivers, canals and individual properties. In order to conduct this process of irrigation modernization wide and extensively, this initiative is presented, which corresponds to a Seed Fund of FONTAGRO. The creation of an international multi-agency network, led by agricultural research institutions of Chile (INIA), Argentina (INTA) and Spain (CSIC INIA) in association with public and private agencies, will allow identified relevant actors, successful projects in irrigation research and management, experiences in technology transfer, infrastructure needs and challenges of agricultural modernization, in the LAC countries. Through a workshop, conditions will be generated for the interaction between researchers and agencies to generate a Joint Project for the consolidation of a “Water Management Platform in Agriculture 2030-2050” in which will be proposed concrete actions to develop programs of short, medium and long-term for the modernization of the management of water resources in agriculture in the LAC countries. For the development of this Seed Fund, an invitation is being made to the agencies that are interested in participating, both in the development of the workshop and in the formulation and development of the Joint Project. To express interest in this project, the issuance of a Letter of Counterpart Contribution (link) is required where a contribution in cash or value is indicated. FONTAGRO is a unique regional cooperation mechanism that promotes innovation in family farming, competitiveness, and food security. It was established in 1998 and is comprised of 15 member states that have contributed approximately US$100 million in capital. FONTAGRO is sponsored by the Inter-American Development Bank (IDB) and the Inter-American Institute for Cooperation on Agriculture (IICA). Its Technical and Administrative Secretariat is based at IDB headquarters in Washington, D.C. FONTAGRO has co-financed more than 135 projects and initiatives for its member countries in the amount of nearly US$105.5 million, including contributions from other funders and executing agencies. The countries that make up FONTAGRO are Argentina, Bolivia, Chile, Colombia, Costa Rica, Dominican Republic, Ecuador, Honduras, Nicaragua, Panama, Paraguay, Peru, Spain, Uruguay, and Venezuela.